Rich with old Hollywood glamour, Native American mystique, 300 + days a year of perfect sunshine, championship golf courses, breathtaking desert and mountain landscapes and the home of Mid-Century Modern architecture, Palm Springs is unique by anyone’s standards. Small city charm with big-city amenities, Palm Springs has been the destination of choice for celebrities, snowbirds, and world-seasoned travelers for decades. 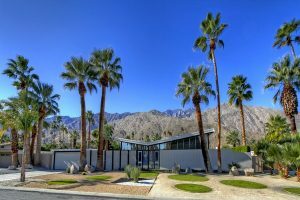 From prestigious luxury estates to sleekly modern, mid-century bungalows, Palm Springs has it all, making it the perfect choice for year-round living or a vacation getaway. Palm Springs has acquired a rare reputation for sophisticated elegance paired with the casual outdoor California lifestyle. Iconic movie colony neighborhoods set against a backdrop of the breathtaking Santa Rosa Mountains reminds visitors that they are surrounded by entertainment history, coupled with the legends of the 3,000 year old Cahuilla Indian culture that still thrives in the majestic, surrounding canyons. Famous Palm Canyon Drive extends through the heart of the city and is home to some of the most famous and popular names in fine dining, luxury lodging, superb entertainment and unparalleled shopping. The place to see and be seen, Palm Springs is still home to some of the most famous faces in silver screen history. Each unique home has a story of its own, many of which are a part of the annual Modernism Week tours. Fine art fairs, museums, concerts and distinguished speaker series are hallmarks of the high level of culture and education that are part of life in Palm Springs. A playground for all ages, Palm Springs is exciting and wonderful all year long. Relax in the celebrity haven that kept stars like Frank Sinatra and Marilyn Monroe coming back year after year. For additional information on the exciting Palm Springs real estate market, please call (760) 541-7010 or email Brad@BradSchmett.com. You may also tour the website for a customized search of real estate in Palm Springs or other Palm Springs Area communities. There are 10 incredibly unique cities in the Greater Palm Springs area, each with their own special flavor and feel. Choose the one that suits you best!